There's nothing better than a fine cigar. After a long day at work, a cigar is perfect to wind down and relax. If you're out with family or friends, lighting a cigar is a great social pairing. Many situations call for a cigar, but did you think which beverage also pairs well with cigars? But don't choose just any drink. Certain drinks pair so naturally with a cigar - it's like peanut butter and jelly. Having this knowledge requires some basic facts about tobacco flavors and hidden notes. Here's what to drink with cigars. Wine is one of the best cigar pairings. Any event calls for a glass of wine and a cigar; whether it's family dinner, a formal event, or a night on the town. But the cigar and wine pairing are complex. And it all depends on the type of cigar you're smoking. For mild-to-medium cigars, choose an equally modest wine. Any fruity wines are the perfect option; the sweetness blends perfectly with the cigar's spice and sugary flavor. Choose Pinot Noir with a mild or medium-bodied cigar. For medium-to-full bodied cigars, choose a classic red wine such as Merlot. Since you're getting stronger with your cigars, you'll want to increase your wine bitterness. But a Merlot is a happy medium for your earthy yet flavorful cigars. For full-bodied cigars, go for a dry red wine such as Cabernet Sauvignon. 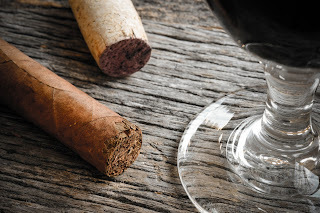 Full-bodied cigars are stronger, thus pair well with a bitter and full-bodied wine. Is wine too fancy? If you go hard with cigars, go hard with alcohol. Fortunately, cigars pair well with many types of spirits. "Spirits" describes a wide variety of liquor. Which one do you choose? A nice bourbon, whiskey, and brandy pairs amazingly with cigars. Cigars have a robust flavor. The spirit should match with the cigar, which is why dark spirits work best. Which spirits should you avoid? The cigar will overpower any white spirits. Avoid vodka and gin when smoking a cigar. Are you not into alcohol? You have other options besides wine. Coffee is a perfect cigar pairing. But don't reach for the Frappe just yet - certain types of coffee pair better with cigars. You should first reach for the dark roast. This coffee is full-bodied and has a variety of complex flavors, just like cigars. If you prefer mild cigars, you can reach for a milder coffee blend such as a medium roast. While enjoying a cigar, why don't you enjoy a drink with it? But before picking up any beverage, you need to know what to drink with cigars. Wine, dark-colored spirits, and coffee are favorites for so many cigar aficionados. These beverages are full-bodied and complex, just like the cigar you're smoking. What are you waiting for? Pick up a cigar and a glass! Are you ready to relax with a cigar and your favorite beverage? Order cigars and cigar accessories from us.